If you are even remotely into weight training or bodyweight training, you must be familiar with the all mighty exercise called “dips”. This is probably the best exercise that you could do for your upper body (well, front upper body to be more specific), even if you want to stay away from gym equipment such barbells, dumbbells or cable machines. Regardless of your scope – build muscle or build strength, or maybe just getting a leaner and toned up physique, dips should be included in any workout regimen. Therefore knowing all there is to know about this exercise is very important. That being said, let’s dive into the benefits of dips and learn how to make the most out of this tool. Most beginners stay away from dips simply because they say they can not do them – usually novices simply do not have enough strength to be able to push their body weight up. I know for sure I couldn’t do them when I first started out at 240 pounds and with very little muscle mass on my body. And that’s ok, everybody has to start somewhere. Fortunately enough, if you have access to a dip machine you can easily perform dips by setting the machine to compensate for a fraction of your bodyweight. Or you can simply do bench dips which any beginner should be able to do easily. Alternatively, if you are an advanced lifter, once dips become too easy for you to do because you are getting stronger, there is always to option to add more weight or perform different variations of the exercise which put more tension on the muscles, making the exercise harder to perform. 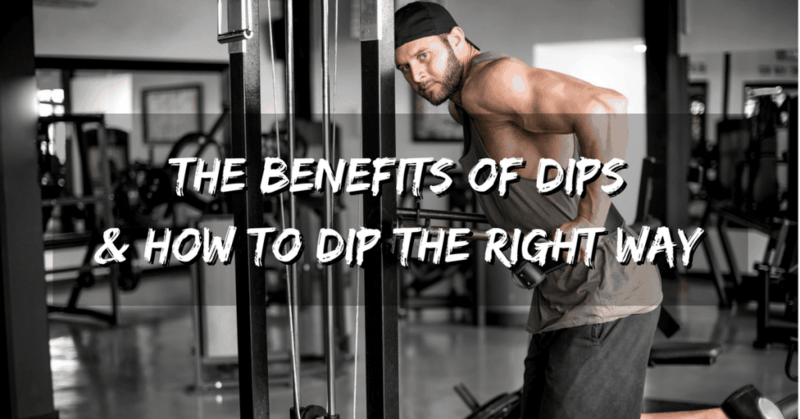 In short, no matter if you are a newbie or an advanced athlete, dips can be adjusted so that they match your training level. It is a well know fact that compound exercises are superior to isolation exercises in almost every aspect – building strength, gaining mass and also for burning more calories. Compound or multi joint exercises allow you to train several muscles at once, in dips case you will develop your chest, your triceps and shoulders. Dips are literally the best exercise you can do for your upper body. Many people say they are very similar to squats in that way, which is the ultimate compound movement for building the lower body. Depending on how you dip, you will control how much of the chest, triceps (and a little bit of shoulders) you put into the movement, but more about that later on. There are so many ways to adjust the parameters of this exercise – you can add more weight by hanging a chain from your hips, you can play with the tempo by doing them really slow, or you can pause during the rep and so on and so forth. You can lean forward more or less so that you put more of your chest into it or you can use a narrow hand grip and put more triceps into the movement. It’s and extremely customizable exercise that it will enable you target different body parts depending on what you want to focus on during your training. Most of the time dips are used to train the lower part of the chest (they are very similar to decline bench press in this regard), or to train the triceps. The front side of the delts are also hit a little bit by dips, but under no circumstances dips should be considered a shoulder exercise. Apart from the fact that dips are great for developing strength and muscle mass, it’s also a great exercise for developing flexibility. One of the reason why so many people don’t do dips is because their shoulder are all damaged and they are in pain when doing dips. However, if you invest time and effort to dip properly, not only you will get stronger and build a bigger upper body, but you will also develop your flexibility. Dips are also a great way of making your joints stronger – your wrists, elbow and shoulder joint are all involved in this exercise. Then, the stabilizing muscles are also being used heavily by dips, which will eventually result in solid upper body. And a solid upper body will be less susceptible to injuries when performing other heavy weight exercises such as incline bench press or shoulder press. Dips are the foundation of calisthenics workouts and all the bodyweight / calisthenics cool movements that you see in the street workout videos. 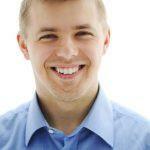 So if you plan on getting into bodyweight training, dips are the very first step you need to be doing. As briefly mentioned above, with the dips we have several possible variations that are based on body position – there are 3 different lower body positions you can take, 3 different torso angles you can chose from, and you also have 2 different elbow positions you can use. The so called standard dip exercise uses the middle position of both lower and upper body. The upper part of the legs should point directly to the ground (perpendicular to the ground), while the lower leg can be bent, especially if you are tall and your legs are touching the ground. Then the torso should be slightly angled forward, not an extreme bent, not straightforward, but just a 30 degree bent forward. With the lower and upper body in check, all we need to adjust is the elbows position, which should be in a neutral position, not tucked in too close and not too wide open. And that’s how the basic dip movement is done. This will hit both chest and triceps equally. The range of the movement that you want is to have the shoulder slightly lower than the elbow level, not a lot lower because it may cause injuries and not higher because you are not using the full range of motion. The first variation you can make is to increase the chest involvement in the dip. This can be done by adjusting both your lower and upper body position as follows. Upper body should be bent forward more, close to a 45 degree bent angle, and the legs should point forward as well. This might be a trick position to get into, but if you really squeeze your abs you should be able to get it right. By doing these 2 small changes your body weight is shifted forward and more emphasis will be put on your chest. That’s how you do the chest dip. Basically this is the opposite of the chest variation. What you want to do here is to shift your body weight to the back instead. To do this you need to keep the upper body as straight as possible (perpendicular to the ground) and your bring the legs backwards as much as you can. To maintain this position you squeeze your glutes and lower back to keep the position. The last variation you can make is changing the hand width. Narrow width and tucked in elbows will put more stress on the triceps, while wider hand grip will bring more chest into the exercise. Of course there are also more advanced dips variations such as ring dips, pause-reps and so on which you can try out once you gain experience and strength. I encourage you to include at least a couple of sets of dips whenever you are training your triceps or chest and you will be amazed by the results. Remember to set the training intensity and rep range so that it matches your goals and you are set to go. This exercise will give you the best bang for your buck in the gym. Don’t just take my word for it. Try it yourself.